We are excited to announce that members of the Philadelphia Student Union will be joining us to share their experiences around creating a youth-led movement to fight for educational justice in their city. Through running school-based, citywide, and statewide campaigns around issues such as prison-like school environments, wide-spread school closings and staff cutbacks, lack of resources, high staff turnover rates, and suppression of youth leadership, PSU has been a forced to be reckoned with for 20 years! We are extremely excited and humbled that members of PSU are traveling to the Twin Cities to share their work with us and to participate in the Fair. Only three days left to submit your workshop proposals! We’re looking for quality workshops of all types by students, parents, school staff, educators, after school workers, and community members for this year’s theme “Nothing About Us, Without Us, Is For Us”. Check out our website for more information about the theme and to submit a proposal. We encourage folks to submit their proposals by the deadline. If for some reason you or your group are unable to submit a proposal before this deadline and would like an extension, please let us know. Stay tuned for more exciting announcements about space (we’ll be in St. Paul this year! ), awards, and other exciting news leading up to the fair. 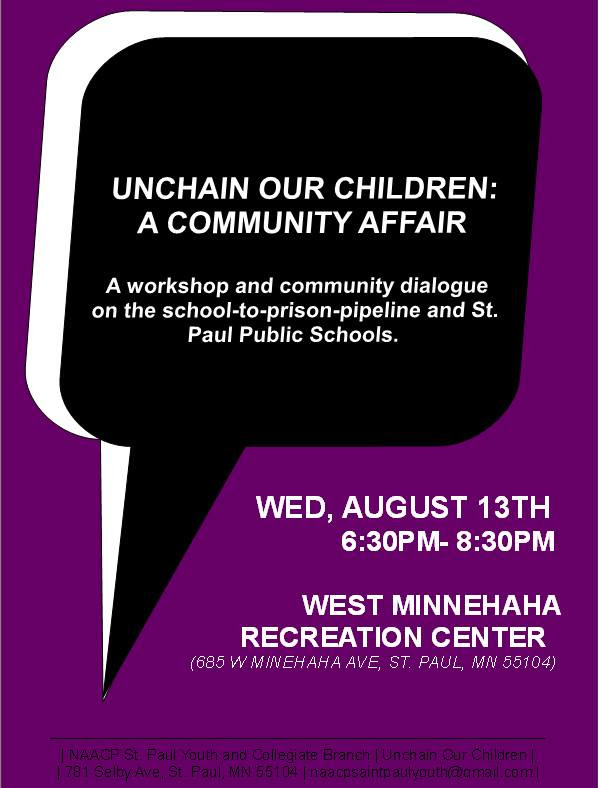 We are excited to host the second Twin Cities Social Justice Education Fair Youth Track Meet-Up next week. Please join us if you are interested in helping to plan and recruit youth-led workshops and creatively vision other activities and meaningful spaces for youth at this year’s fair. All folks but especially young people of color, young queer folks and young women are welcome here! Fair Updates: Youth Track Meet-up and much more! 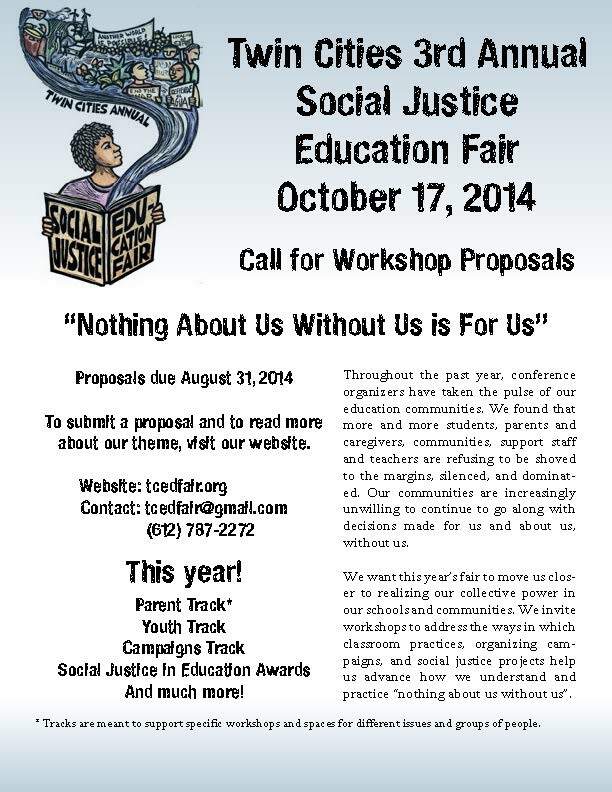 We are excited to host a Twin Cities Social Justice Education Fair Youth Track Social Gathering next week. Please join us if you are interested in helping to plan and recruit youth-led workshops and creatively vision other activities and meaningful spaces for youth at this year’s fair. Young people of color, young queer folks and women are especially welcome here! At last week’s campaigns meet-up, educators, students, community organizers, and parents came together to discuss a wide variety of campaigns and organizing in the Twin Cities social justice education movement. Stay tuned for more information about upcoming meet-ups for the campaigns track and parent track! Help us meet our fundraising needs for this year’s fair! Based on last year’s costs and our expected increase in size this year, we are estimating that we will need to raise $2,000 in addition to other fundraising we are engaged in. Please contribute what you can to help us reach our goal and to continue to make the fair free to attend with meals and childcare provided for all! Please share this indie-go-go campaign with others! We’re looking for quality workshops of all types by students, parents, school staff, educators, after school workers, and community members for this year’s theme *Nothing About Us Without Us Is For Us*. Check out our website for more information about the theme and to submit a proposal. Don’t forget to submit a workshop proposal for this year’s fair! Proposals are due by August 31, 2014. We’re looking for quality workshops of all types by students, parents, school staff, educators, after school workers, and community members for this year’s theme *Nothing About Us Without Us Is For Us*. Go to our Call for Proposals page to read more about our theme and to submit a proposal. Social Justice Education Fair Campaigns Meet Up–this Tuesday, 8/5, 1pm! Are you organizing an education campaign? Or want to be? Come to this meet-up to network, share your goals, and collectively figure out how to use the Social Justice Education Fair this October 17th to build our campaigns and movement. Please contact David or Shannon if you are interested in attending! It’s going to be a great time! Stay tuned for more information about upcoming meet-ups for the youth track (save the date for August 14th, 4-6pm) and parent track (details coming soon)!